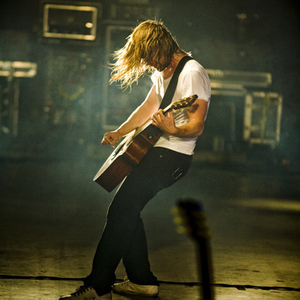 Jonathan Mark Foreman (born October 22, 1976) is the lead singer, songwriter and guitarist of the alternative rock band Switchfoot; one part of the alt. folk duo Fiction Family with Sean Watkins from Nickel Creek; and a folk-singer-songwriter solo artist. Jon Foreman has released four conceptual EPs as a solo artist: "Fall" & "Winter" (2007) "Spring" & "Summer" (2008). He later compiled several songs from each EP into the LP "Limbs And Branches" (2008), which included two new songs. Jon Foreman has released four conceptual EPs as a solo artist: "Fall" & "Winter" (2007) "Spring" & "Summer" (2008). He later compiled several songs from each EP into the LP "Limbs And Branches" (2008), which included two new songs. In 2001 he was awarded the "Les Paul Horizon Award" for the most promising up-and-coming guitarist at the annual Orville H. Gibson Guitar Awards in Los Angeles.